IDF acknowledges strike in Syria - but says downed Russian plane was accidentally hit by Syrian missiles after Israeli jets had left. The Israeli military denied Russian claims Tuesday that Israel Air Force jets were responsible for the downing of a Russian military aircraft in Syrian airspace overnight. Israeli jet planes hit targets in northern Syria late Monday night and early Tuesday morning, reportedly striking weapons research facilities operated by the Assad regime. Shortly after the strikes, Russia claimed that an Ilyushin IL-20 turboprop reconnaissance aircraft had been lost while flying over Syria. While a US official with knowledge of the incident told CNN that the IL-20 had been shot down accidentally by Syrian anti-air missiles fired after the Israeli strike, Russian officials claimed that reconnaissance plane had been shot down before the Syrian air defense network had been activated. The IDF denied the Russian claim in a statement released Tuesday afternoon, stating that Israeli aircraft had already returned to Israel airspace when the Russian plane was shot down. Israel also acknowledged it was responsible for the overnight strikes – a rare break from its policy of not commenting on operations against Assad regime targets. In the statement, the IDF expressed “sorrow” over the loss of the 15 Russian aircrew members, but emphasized that the blame lies with the Syrian government. “Israel expresses sorrow for the death of the aircrew members of the Russian plane that was downed tonight due to Syrian anti-aircraft fire. “Israel holds the Assad regime, whose military shot down the Russian plane, fully responsible for this incident. 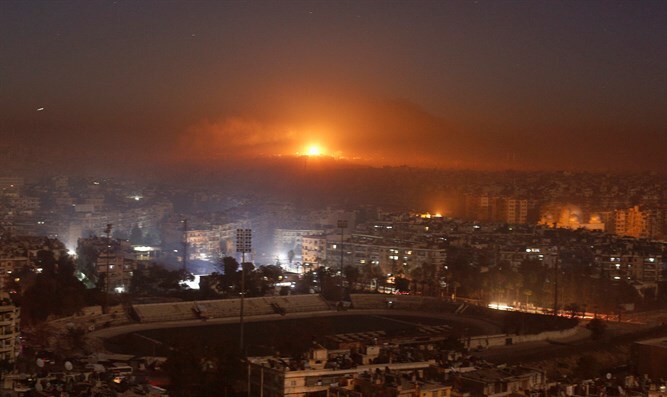 The IDF said that an initial investigation into the incident suggested that immediately after the Israeli airstrikes, the Syrian air defense network fire a large number of missiles, one of which accidentally struck the Russian aircraft. The report noted that the Israel Air Force planes had already returned to Israeli airspace when the Russian plane was hit, and that the Russian aircraft was not in the area of the airstrikes while Israeli aircraft were operating there.